Generally I don’t think of spiders as beautiful. While I appreciate they eat bugs and can make pretty webs, they usually fall into the ‘eww…get it get it! !’ category. On occasion I will see a really interesting one and think it is cool…from a distance of course. Today was one of those rare occasions where I saw it as a source of beauty on my deck. 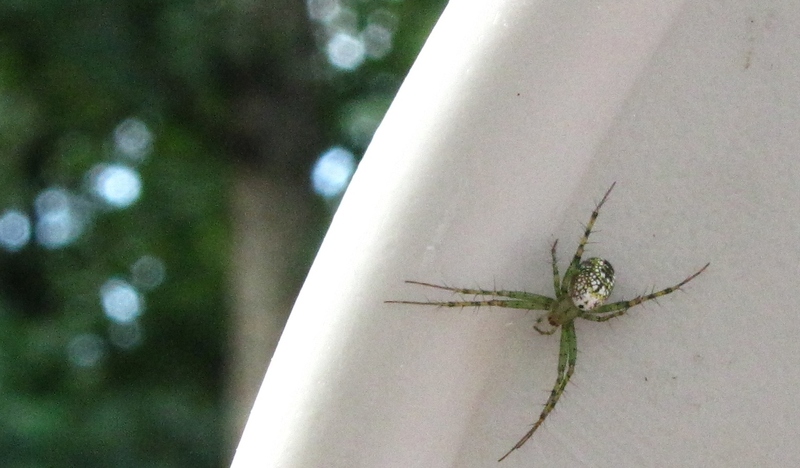 From the green hue of the body to the pattern on her back, or the ‘hairs’ on her legs, this little spider oozes some amazing details. I also don’t usually see a mess as beautiful. Instead I ‘see’ the effort required to fix it. Whether it indicates happy play for my kids, or a learning opportunity for the one who spilled, there is beauty there that I miss. Far too often. Yesterday my son was playing with flour on the deck and this is where it spilled. This morning my daughter drew in the spilled flour. I love the contrasting patterns of the finger stripes in the flour and the wood of the deck. I think I need to view much of life with new lenses. Instead of seeing something as unpleasant, I need to look harder for the beauty. It’s there. Somewhere.